Come see this One Owner 2017 Ford Expedition Limited. Its Automatic transmission and Twin Turbo Regular Unleaded V-6 3.5 L/213 engine will keep you going. 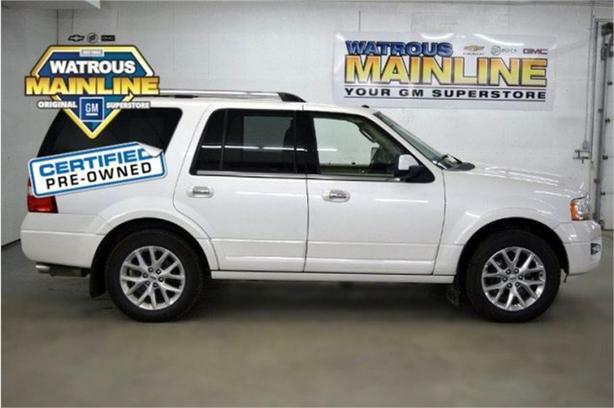 This Ford Expedition features the following options: Window Grid Antenna, Wheels: 20 Polished Aluminum, Trunk/Hatch Auto-Latch, Trip Computer, Transmission w/Driver Selectable Mode and HD Oil Cooler, Tires: P275/55R20 BSW All-Terrain, Tailgate/Rear Door Lock Included w/Power Door Locks, Systems Monitor, SYNC 3 Communications & Entertainment System -inc: enhanced voice recognition, 8 centre LCD touch-screen w/swiping and pinch-to-zoom capabilities, AppLink and 911 Assist, and Steel Spare Wheel. Stop by and visit us at Watrous Mainline Motor Products Ltd, 208 1st Avenue East Box 70, Watrous, SK S0K 4T0.